These substitutions keep you from expending fossil fuels on a grocery run when you don't have to. ‘Mise en place” is a French culinary term that means “putting in place.” In professional kitchens, it refers to the cook organizing and arranging the ingredients she’ll use for the duration of her shift on the line. But the term translates well into the home kitchen, too, in that it’s always a good idea to read a recipe before embarking on it in part to make sure you’ve got all the ingredients on hand. But what if you don’t? Say it’s your aunt’s chewy cherry-chocolate chip cookie recipe but you’ve only got dried cranberries in the cupboard? Do you hop in the car to get the cherries as a purist? Do you flop on the couch with the chocolate chips as a defeatist? Or, ever the pragmatist, do you dive into the recipe with the cranberries? 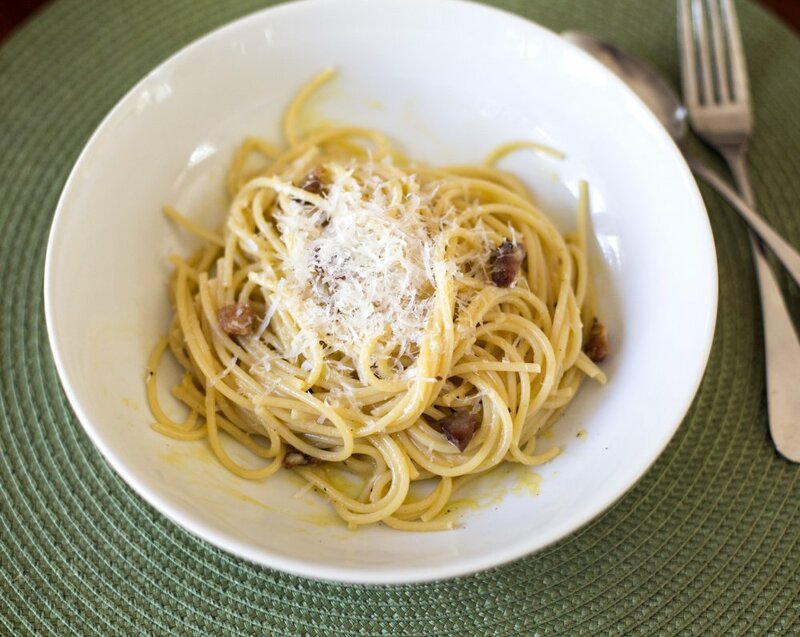 Last month a French video depicting the making of spaghetti alla carbonara – a popular Italian dish comprising spaghetti, bacon, eggs, Pecorino cheese and freshly ground black pepper – raised Italian social media ire when the Frenchman boiled the pasta in the same pot as the bacon and finished the dish with crème fraîche. While my recipe follows the Roman way of folding hot pasta into raw eggs, pancetta and grated cheese to make a luscious sauce, I use whichever pasta, cured meat and hard cheese I happen to have on hand. Place 4 bowls in a very low oven to warm. Heat the oil in a large skillet over medium heat and add the cured meat and cook until golden. Remove pan from heat. Meanwhile, cook the pasta in plenty of boiling, salted water until al dente. Scoop out a cupful of the pasta cooking water, and then drain the pasta well. Add the pasta to the skillet and toss to coat with the pancetta fat. In a bowl large enough to toss the cooked pasta, beat together the eggs and the extra yolk and then stir in all but 2 tablespoons of the cheese. Grind in plenty of black pepper. 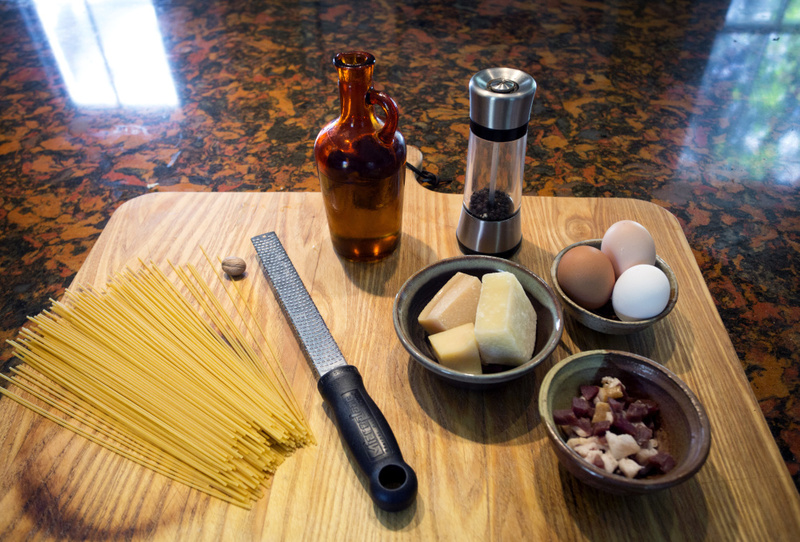 Add the pasta and cured meat, tossing the pasta furiously to keep the egg from scrambling. Then, once it’s begun to thicken, add a couple of tablespoons of cooking water to loosen the sauce. Toss again, and divide among the warm bowls, finishing off with a grating of nutmeg and a little more parmesan. Serve immediately. The couch potato may be the greenest option as he’ll spend neither human nor non-renewable energies making the recipe. But he won’t eat cookies either. The realist gets the best of both worlds. Being a successful culinary substituter requires knowing how ingredients behave in recipes and understanding that all swaps change the result, even if only slightly. Knowing all dried fruits have low moisture levels and high flavor impact means a 1:1 substitution in the cookie example above would work just fine, though the cookies will have a tangier taste. But say you had fresh cherries in the fridge? You could use those, too, if you make an allowance for the fact that they are moister than dried. You could either add a little flour to keep the batter tight or allow for a bit more spread on the cookie sheet, resulting in a crispy, not chewy cookie. “What if I don’t have X?” is the most common question I get asked during my cooking classes. Over the past seven years, I’ve developed my Top Ten Ingredient Substitutions List. If your recipe calls for kosher salt and you only have table salt, use half of the amount specified. • One cup of self-rising flour equals 1 cup all-purpose flour plus 1½ teaspoons of baking powder and ½ teaspoon of table salt. • One cup of granulated sugar whizzed for about 90 seconds in a food processor or blender with 1 teaspoon cornstarch will give you 1¾ cups confectioners’ sugar. • Maple syrup is sweeter than white sugar so use only ¾ cup when the recipe calls for 1 cup of sugar. • When baking, reduce the liquid the recipe calls for (say milk or buttermilk) by ¼ cup and add a large pinch of baking soda to offset acidity. • One cup of light brown sugar equals 1 cup granulated sugar mixed well with 1 tablespoon molasses; bump it up to 2 tablespoons if you need dark brown sugar. • Stirring 1 tablespoon of lemon juice or white vinegar into 1 cup of milk (at least 2 percent milk fat) is a good approximation for buttermilk. • To get the punch 1 tablespoon tomato paste allows, add 3 tablespoons of tomato sauce and cut the liquid in the recipe by 2 tablespoons or, if the recipe allows, simmer the sauce to a paste. • One tablespoon of prepared mustard will work in place of 1 teaspoon of dry if you also subtract 1 teaspoon of liquid from the recipe. • One teaspoon minced jalapeño or serrano chili pepper equals 1 teaspoon hot pepper sauce equals ¾ teaspoon crushed red chili flakes equals ¼ teaspoon cayenne pepper. While I don’t have substitutions for all ingredients in my head, I do have them at my fingertips in a dog-eared copy of “The Food Substitutions Bible by David Joachim.” This is an encyclopedic listing of over 6,500 food stuffs, their practical substitutions, and the replacement ratios by which your recipes will work just fine. Substituting in this way is deeply rooted in old school Yankee mentality. Throw in the CO2 savings of not running to the store, and the practice pulls double duty in the green eating category, too.